Even this limited action is taken only at industry request. The US Food and Drug Administration has amended food additive rules to “no longer provide for the use” of BPA (bisphenol-A) in infant bottles and children’s sippy cups. BPA is a common ingredient in polycarbonate plastics and, as regular Pulse readers know, an endocrine-disrupting chemical that has been linked with serious health problems, including cancer, birth defects, and heart disease. China banned BPA in baby bottles last year; the European Union banned it two years ago, and Canada declared BPA to be a toxic substance. What the FDA is doing is indirectly banning the substance in this one application, without having to say so explicitly or even take a strong position on the subject! Moreover, FDA is being careful not to make any statement on BPA’s safety. All of this came in response to a request from the American Chemistry Council, which is seeking to even the playing field of their producers’ market share. What does this mean? We think this means that some producers are complaining about the cost of using substitute ingredients because of a consumer backlash against BPA, and no longer want their competitors to be able to use it. BPA is not a substance that is Generally Recognized as Safe (GRAS). So several years ago, companies had to seek FDA approval to use BPA, and FDA put it on the official list of approved food additives. 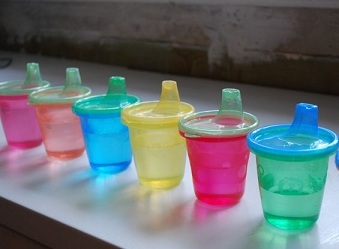 Now FDA has amended that list “to no longer provide for the use of polycarbonate (PC) resins in infant feeding bottles (baby bottles) and spill-proof cups, including their closures and lids, designed to help train babies and toddlers to drink from cups (sippy cups) because these uses have been abandoned” by industry, so baby bottles and cups using BPA-laced polycarbonate will be considered adulterated if they contain BPA. Another factor behind the industry’s change of heart is the slew of state bills that have been introduced and passed banning the use of BPA. In fact, eleven states so far have banned BPA in children’s products. Furthermore, if the ACC is petitioning for the removal of BPA, it is worrying to think about what they are using in its place—since, as we noted a few weeks ago, many products that now boast they’re “BPA-free” have simply switched to a BPA relative that may be equally toxic! FDA’s ban on BPA in baby products is another blessing for the chemical industry: it mitigates the urgency of banning BPA in other products. Because the petition was based on an assertion of “abandonment,” FDA did not request comments on the safety of the use of polycarbonate (PC) resins, which use BPA in their manufacturing process: “Such safety information is not relevant to abandonment and, therefore, any comments addressing the safety of PC resins were not considered in the Agency’s evaluation of this petition.” How convenient! By sidestepping the issue of safety, FDA is protecting the chemical industry’s stake in using BPA in other applications—or liability for past use in baby products. While we are pleased that infants will no longer be exposed to BPA in their bottles and cups, we would argue that this ban doesn’t go nearly far enough. FDA is not considering other things that children can put in their mouths, such as pacifiers, teethers, tableware, or items that may come in contact with breast milk, such as breast pumps, pumping supplies, or breast milk storage kits—not to mention children’s dental sealants, fillings, and dental devices. ANH-USA filed a petition with the Consumer Product Safety Commission to ban BPA in thermal cash register receipts, the principal means by which BPA appears to enter mothers’ bodies. Our petition was denied. We still have a request pending with OSHA. The Natural Resources Defense Council (NRDC) filed a petition with FDA to have BPA banned from food and beverage containers (most tin cans are lined with BPA). After the request was left hanging in limbo for three years, NRDC filed a lawsuit to force a response. FDA finally ruled against the petition. Even Rep. Ed Markey petitioned FDA to ban BPA, though FDA has yet to respond. A recent study indicates that BPA may affect memory and alter brain structure in adults. Another study shows that BPA’s estrogenic effects can encourage insulin release, which promotes diabetes. It is clear from what has just happened that the only way BPA will be removed from other products is for consumers to refuse to buy them. The FDA couldn’t care less.